It has witnessed Neymar's mesmerising footwork, the emotional crooning of Coldplay's Chris Martin, even the surprising agility of monster trucks. Next year, the Singapore Sports Hub will introduce yet another unique proposition - golf inside the National Stadium - complete with sand bunkers and trees. The Hub's Stadium Golf event will feature greens constructed on the pitch, with golfers teeing off from various points across the stadium's stands, playing for accuracy and prizes. Speaking on the sidelines of a media lunch yesterday when some of its offerings for next year were revealed, Singapore Sports Hub chief executive Oon Jin Teik was confident that the golf event - targeted at corporations for now - will set pulses racing. "We have offerings in the venue that are already quite comprehensive, and with golf in Singapore very popular, this presents a unique proposition," Mr Oon said of the all-weather event, which allows corporations to entertain clients and drive their respective brands. "From a target audience angle - the corporates - there is a strong need for a more intimate engagement for their business objectives. "We are not sure if we will take this event to consumers yet," he added. Stadium Golf is just one of Sports Hub's diverse offerings for next year, which include a Spartan race, a Japan Summer Festival and several concerts featuring the likes of American pop rock band Maroon 5, British singer Ed Sheeran and Mandopop star Wang Leehom. The International Champions Cup (ICC) that has featured the likes of Chelsea and Paris Saint-Germain in the past will also return next year. Mr Oon revealed that football fans can expect a "big team" to grace the Hub's crown jewel. It would be interesting to note that English Premier League giants Manchester United have announced that they will play in Perth, Australia, on July 13 and 17 as part of their 2019 pre-season tour. The last two editions of the ICC in Singapore were held some time in the last two weeks of July. The Hub's chief commercial officer Adam Firth was confident that TEHC International, a company specialising in horticulture and arboriculture that is responsible for the National Stadium's pitch, will ensure excellent conditions of the pitch for the different events. 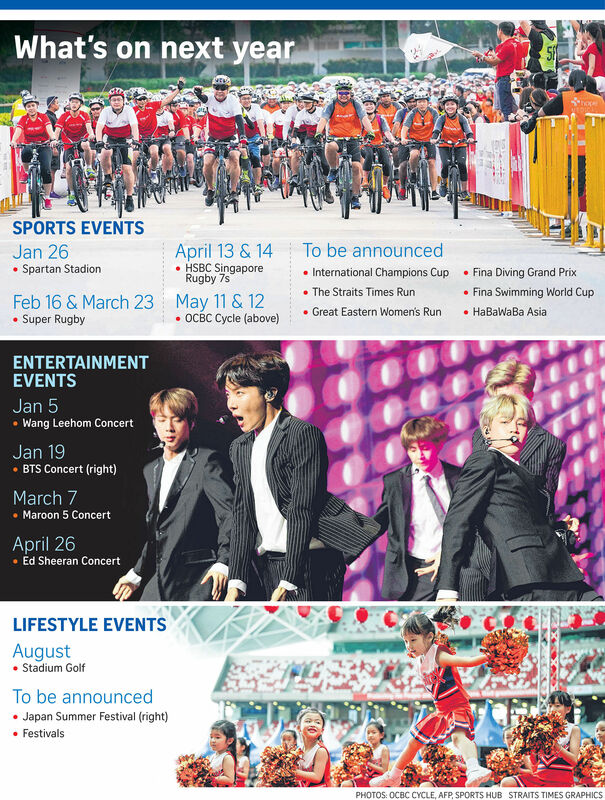 "The mix of events is diverse and exciting, and with these other events, we have got to give these guys (TEHC) enough time to build the golf course in the vision that we have," said the Australian, who pointed out that Stadium Golf is sandwiched between the ICC and The Straits Times Run on the calendar. "It is quite a unique event, and we are excited."